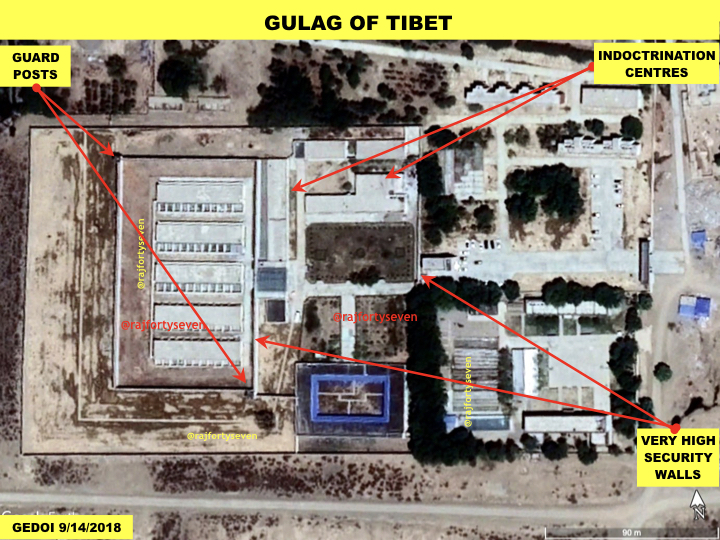 ThePrint has identified at least three re-education centres - or 'Gulags', as the Soviet-era equivalents were called - under construction in Tibet. New Delhi: China’s foreign ministry vehemently claims that the ‘re-education-through-labour system’ has been abolished, and that the vocational education and training programmes in Tibet and Xinjiang “could not be more different to the so-called forced labour” as reported by sections of the Western media. 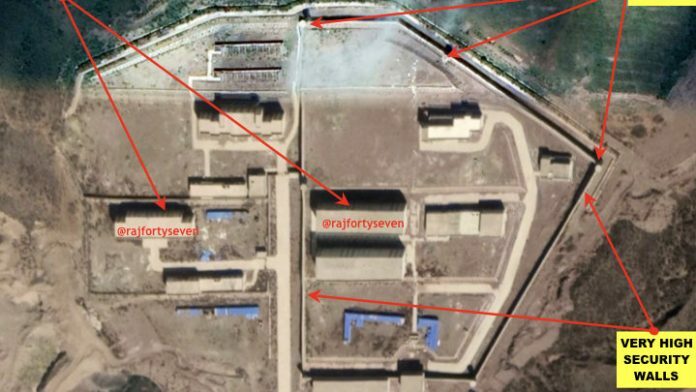 But exclusive satellite imagery accessed by ThePrint contradicts Beijing’s claims. 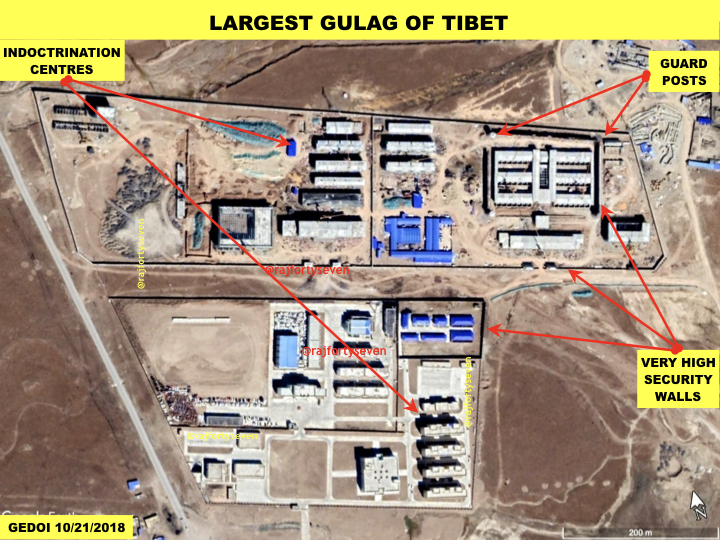 The images show at least three re-education centres – colloquially known as ‘Gulags’, after the Soviet-era equivalents – under construction in the Tibet Autonomous Region. ThePrint had last August reported the existence of such major camps in the western province of Xinjiang. These camps were also indicated in the United Nations and the US Congressional-Executive Commission on China. Today, Tibet faces similar control over religion, language and culture and the ‘Sinicisation’ and ‘Hanisation’ of non-Chinese cultures by the Han is almost complete in Tibet, Tibetan activists claim. According to these activists, the religious subjugation of Tibetans has been carried out since China’s occupation of the region in 1958. Almost 6,254 monasteries were allegedly razed by the mid-1980s. All Tibetan monasteries today are said to be Sinicised. Chinese language is allegedly imposed in schools and colleges, while the use of Tibetan language is dissuaded. 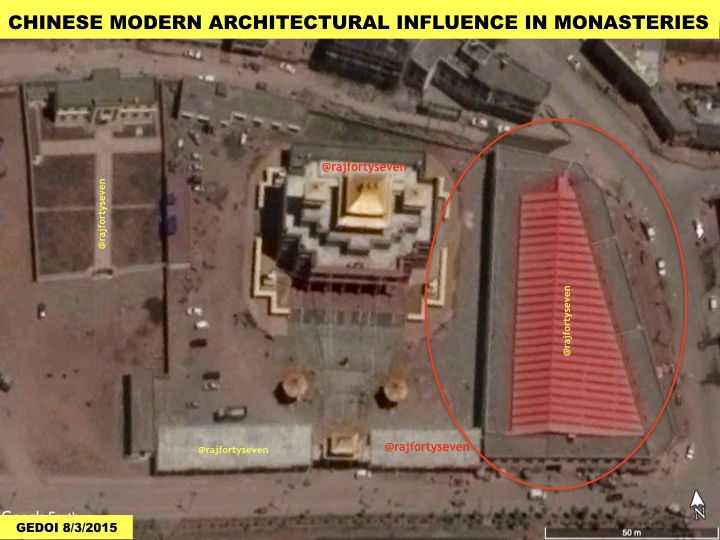 Monasteries are being rebuilt or renovated with Chinese architecture. The new monasteries are generally far away from towns and cities, apparently to avoid any contact with the population. One such monastery is located in Kardze prefecture in the Kham region of Tibet, which is earthquake-prone and was damaged by a 2012 quake. 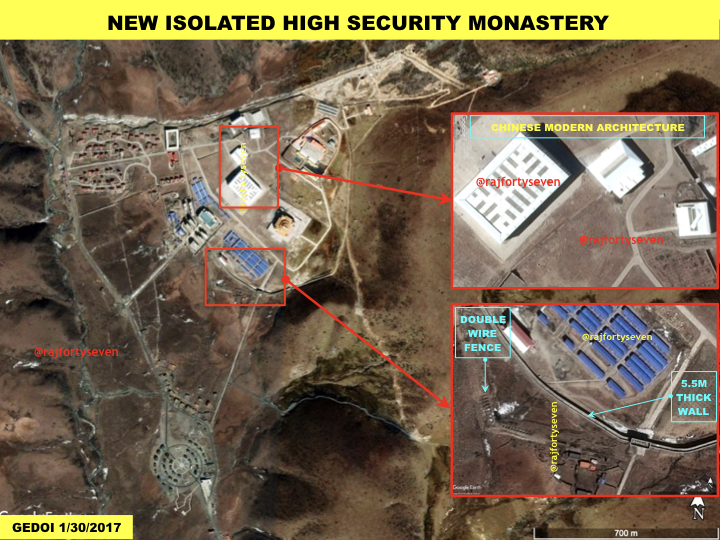 The area, it is believed, was selected to build a highly-secure monastery featuring a perimeter wall over 5m wide, buildings with the influence of modern Chinese architecture, and an outer perimeter combining double and single fences. Other recently-constructed monasteries also show the clear influence of modern Chinese architecture, which allegedly helps monitor all activities in these religious places. 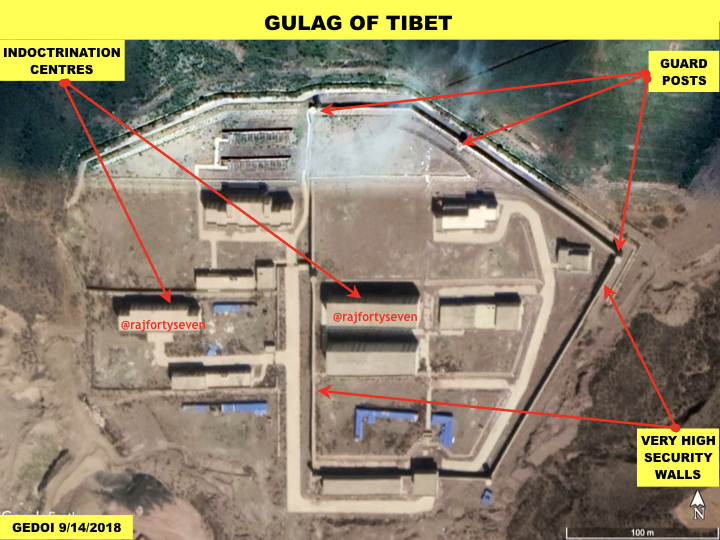 These monasteries, it is suspected, are used as correction facilities or Gulags for Tibetan monks who are unwilling to follow the diktats of the Chinese Communist Party. 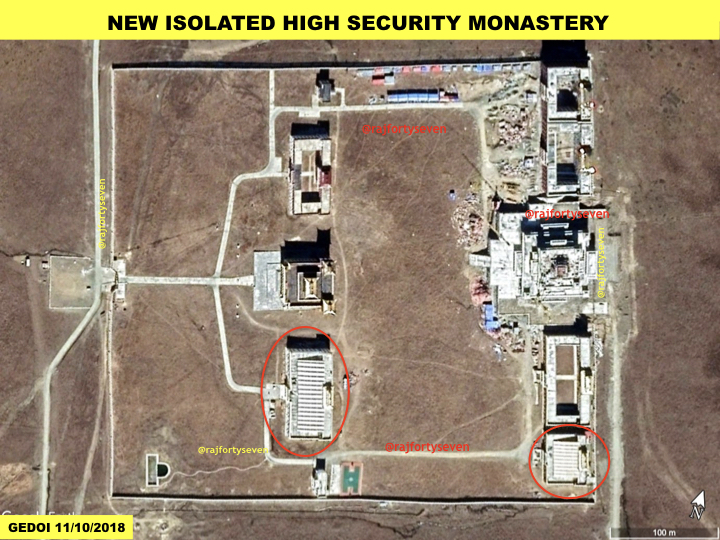 Recently-updated satellite imagery has also revealed that massive structures are being created by Chinese authorities in the Tibet Autonomous Region. They are what are referred to as ‘extremist eradication’ schools or ‘re-education’ schools. These are allegedly used as detention centres for political indoctrination. The detainees are also allegedly used as forced labour in government factories and projects during the day time or as per shift timings. At least three such facilities can be identified through satellite imagery, though none of them is fully constructed yet. All three ‘Gulags’ have high wall fencings, with the inner wall fencing taller than the outer wall. The inner walls have round guard posts at the corners. The indoctrination centres are located outside the main high inner walls and have administrative and other support buildings co-located.